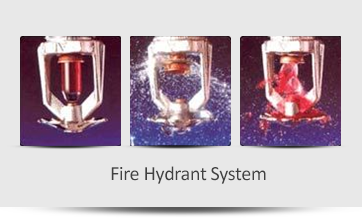 SRPA offers Fire Hydrant System and Automatic Water Sprinkler System. We supply and install pressure operated systems which are technologically advanced and have no external moving parts that it is Failsafe and easy to maintain. The Components, System Design and the engineering meet the requirements of NFPA. SRPA offers complete range of fire suppression system which can comprise of Fire Hydrant System, Sprinkler System, Gas Based Fire Suppression System (FM 200, Inergent and sinorix). SRPA’s exquisite range of fire sprinkler systems that could be installed in offices spaces, hotels, hospitals and multiplexes etc as part of fire suppression systems. These fire sprinkler systems are attached to water distribution piping systems with enough water pressure and flow rate. Fully automatic, these fire sprinkler systems operate at a preset temperature. SRPA Fire Control System providing Services of Automatic Water Sprinkler System, Fire Hydrant System Services, Fire Fighting System, Fire Hydrant System in Delhi, Bangalore and Hyderabad.